At the end of every fall and spring semester, we welcome Engineering Online’s graduating students to visit campus and celebrate their accomplishments alongside their peers. But some travel farther than others to see the home of the Wolfpack in person. Walking the stage during the Department of Chemical and Biomolecular Engineering’s graduation ceremony. Why did you decide to enroll in the Engineering Online program at NC State? When I did my first master’s in Fiber Technology, I chose a project on synthetic textile fibers. I decided to work in this field of synthetic fibers and eventually, I got a job in a polyester manufacturing company. To enrich my knowledge and qualification for this field, I decided to get an education in chemical engineering. Unfortunately, I couldn’t find any university in Pakistan that offered an online master’s degree in chemical engineering while allowing you to stay at your workplace. So I started to search for a good university that offered online degrees and had good rankings. 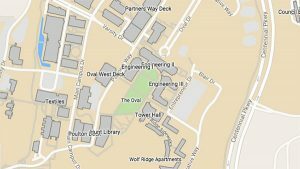 I found NC State’s Engineering Online program, which had an edge over other universities in the United States. Some major reasons I selected NC State were university rankings, tuition fees and eligibility requirements. 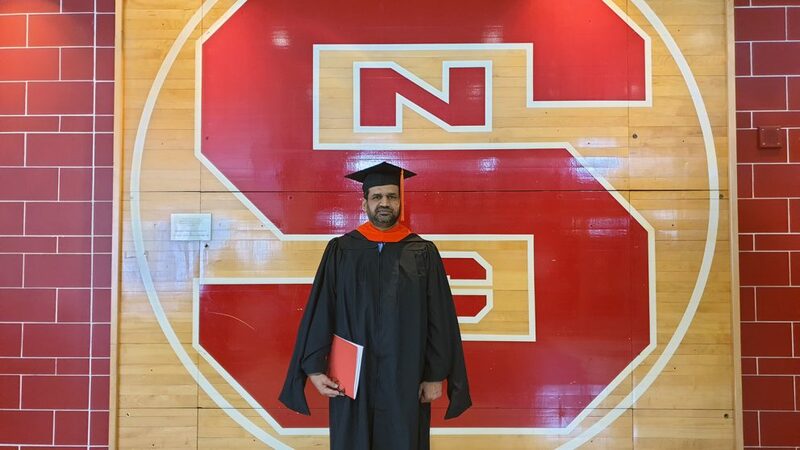 Now I have three master’s degrees to my name: a master of science in fiber technology, a master of science in quality management and a master of science in chemical engineering. Why did you want to attend your graduation ceremony in person? I wanted to visit the university during my studies, but that was not possible while I was working. I had planned to attend the graduation ceremony from the beginning of my studies. It helps to meet with different people across the globe — especially if they are professors, students and university staff members. I also wanted to see the university from which I got a master’s degree, and I wanted to have some recorded, memorable moments. I traveled from Gujranwala, Pakistan to Raleigh. It took almost 28 hours. Meeting with the Engineering Online staff in Page Hall on NC State’s campus. How did it feel to attend the ceremony? What was your favorite part? It was a dream to attend my graduation ceremony; the feeling was spectacular. 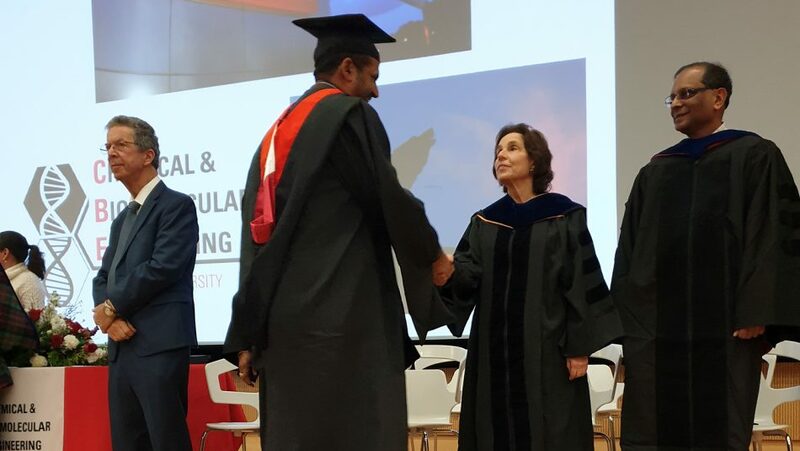 My favorite parts of my four-day visit were meeting the chancellor and receiving my diploma from Dr. Fedkiw during the departmental graduation ceremony. 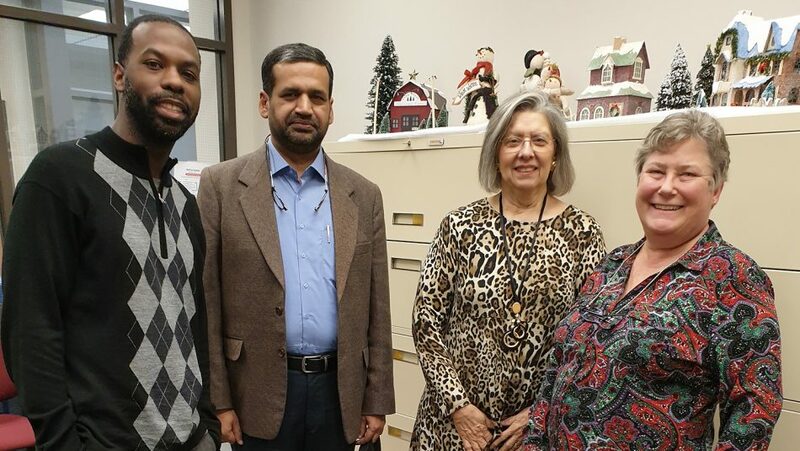 I also met with most of the faculty members who taught us during my master’s program including Dr. Saad Khan, Dr. Gregory Parsons, Dr. Lisa Bullard, Dr. Phillip Westmoreland, Dr. Orlin D. Velev and Dr. Michael Dickey. And I met staff members from the Engineering Online unit. How has your degree helped you since graduation? This degree has helped me in a number of ways. I’m currently Works Manager at a soap manufacturing company, First Treet Manufacturing Modaraba, where I look after the complete activities of the soap division. I applied the knowledge I attained through this degree in my professional life, improved my status within my company and, last but not least, my confidence level has improved tremendously. This post was originally published in Engineering Online.